Steeples are visible from the port, and a short walk will take you to Fécamp's historic churches. The best known church in Fécamp is the large Abbatiale de la Sainte-Trinité, near the ruins of the Château des Ducs Richard and the Hôtel de Ville (map). Built on the site of older churches, the current church was established over several centuries, with Romanesque sections dating from the 12th century, as well as Gothic and Renaissance parts. Although it may look small from the outside, it is actually very large. 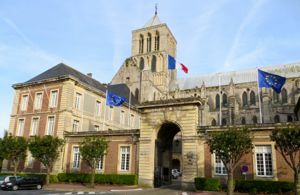 Fécamp is justly proud of its abbey church, which symbolizes the prestique of the town as the capital of the Dukes of Normandy. It is known for its lovely stained glass windows and its chapels, as well as for its pilgrimage of the Holy Blood, famous in the middle ages. The tombs of the Dukes of Normandy are also here. When you visit, be sure to also look around at the lovely Hôtel de Ville and the ruins of the Château des Ducs Richard. Although the first ducal residence was built in the 11th century, Richard I and Richard II made Fécamp a capital of the Duchy. In 1067 William the Conqueror celebrated his victory at Hastings in Fécamp (though he later moved to Caen). Henri II Plantaganet also fortified the castle in Fécamp, but the duchy was annexed to France in 1204. The lands eventually became part of the monastery property. 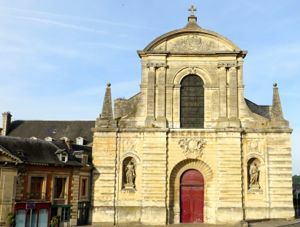 Above, Front view of the Abbatiale de la Sainte-Trinité, Fécamp. Below, Side view, with the Hôtel de Ville in front, showing the tower and the length of the abbey church.